Weller, Jac. Wellington at Waterloo. London: Greenhill, 1998. 320 pages. ISBN 1-85367-339-0. £12.95/$18.95. Paperback. 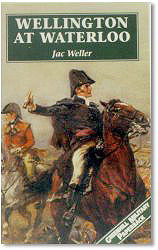 Greenhill Books have printed in paperback for the first time, Jac Weller's classic study of leadership at the climatic battle of the Napoleonic Wars. One of the purposes that Mr. Weller had in writing this book was it to serve as a tool for teaching leadership to young military officers. Rather than providing the reader with an overview of all the events that were happening, when they happened, Mr. Weller provides the reader only with the information that Wellington would have had at the time he needed to make a decision. This information or lack of information is then analyzed to show how it affected his decisions at critical moments in the battle. Although this approach limits the reader ability to gain a complete picture of this decisive battle, it goes far in explaining Wellington's style of leadership and the genius behind it. Wellington at Waterloo covers the key aspects of the Campaign of 1815, including a brief summary of the political events that led up to it; the military composition, capabilities, and limitations of the three main armies; the main events of the battles that the British did not fight at (Ligny and Wavre); and a detailed description of both Quatre Bras and Waterloo from Wellington's perspective. Mr. Weller closes with an analysis of why the Allies won, the ordnance used by both sides, and the mistakes made by the British, French, and Prussian commanders. Mr. Weller not only provides a highly detailed order-of-battle for the Anglo-Allied Army down to regimental level, but gives the strength of each regiment and in the case of the British, whether it was part of his famous Peninsula Army that fought the French for six years in Spain and Portugal. Unfortunately, he does not provide much information on either the Prussian or French armies, going down only to the brigade levels for each. In addition to its unique approach of being a study in leadership, Wellington at Waterloo contains items that I have not seen in any other book. One of its chapters is "Cavalry Attacks on Infantry Squares." In it, Mr. Weller goes to great lengths to explain why infantry squares were usually impenetrable to cavalry but then takes it one step further. He illustrates it by showing a square of 500 men and what the maximum number of cavalry troopers it would have to face at one time. In this case one picture is worth a thousand words. Mr. Weller's writing is so clear that many of his theories and explanations stand-alone. Yet he goes one step further and uses numerous photographs of the key terrain both from the ground level and from the air to illustrate his points. These photographs were taken thirty to forty years ago and give the reader a greater appreciation for the terrain since many of the modern roads and buildings were not built then. He also includes a chapter of the military topography of the battlefields and advice for touring them. Even though the advice was written in 1965, much of it is still valid today. In this section there is information comparing the population of key cities and villages in 1815 to its population in 1965. The book has eight maps and includes diagrams of La Haye Sainte and Hougoumont. Wellington at Waterloo provides one of the best assessments of the campaign from the British perspective. This book is a must read for both the casual reader and the serious scholar. For those readers who are not satisfied with just the British viewpoint and would like the Prussian perspective, I recommend that they read Peter Hofschröer's 1815 - The Waterloo Campaign, Wellington, his German Allies and the Battles of Ligny and Quatre Bras also published by Greenhill.